If you haven't made the switch yet, let me commend it to you. Among other niceties, spell checking is inline--for any form text area you happen to be typing. A blog entry, for example, as the entry above--which I entered via an old Windows ME system with Firefox 1.5 still resident. Have you seen A Christmas Carol yet this year? We took in the Patrick Stewart version the other night; were reminded again of the joys of seeing Christmas anew. And were reminded, too, of the oft repeated lesson of "Beyond the Basics" last week. Content matters. Great writers are great because they are more than momentarily entertaining. "A Christmas Carol" changes your life more than 20 episodes of most any TV show. David Copperfield has more to say about the nature of man than six semesters of behavioral science classes. Which brings up our Christmas wish for the 50% of urban and minority kids who might but probably won't graduate in the coming years. Might would-be teachers and teachers returning for Masters training study far less pedagogy and memorize far more Dickens and Shakespeare. The quarterly issue of History Now is out from Gilder Lehrman. This time they look at gadgets and the people who brought them. 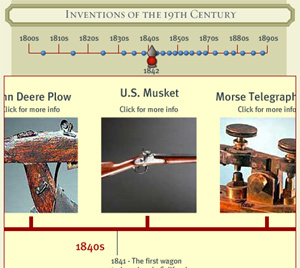 A beautiful interactive timeline lets you learn more. Shocking. OK, maybe not. Shucks, we would have thought the number much higher. And who knows, maybe B students are simply more honest in surveys, recognizing the need for solid marketing data and all. At least all these dishonest louts have been good for the career of one Donald McCabe, who has made his profession at Rutgers studying them. His C.V. lists publications, alas with no hyperlinks. Why, there is even an International Plagarism Conference. Here's the Conference Proceedings. Alexander Hamilton, where are you? (Sr. Annunciatta, where are you?). 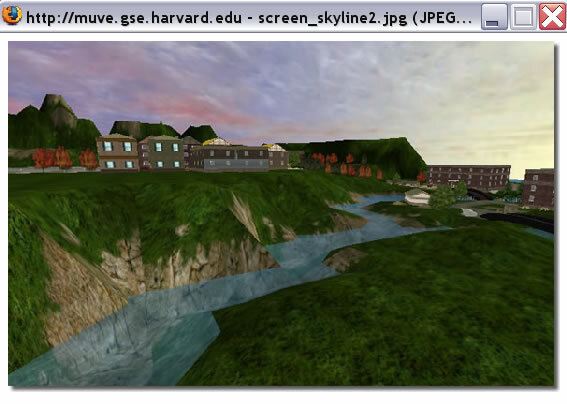 One of the excellent people we met Thursday was Ed Dieterle, a Harvard researcher in technology and education. 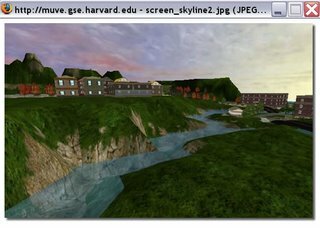 The River City Project is billed as "A Multi-User Virtual Environment for Learning Scientific Inquiry and 21st Century Skills". It looks sweet. The interactive uses a downloadable client not accessible to the general public. However, our lofty status as educational geeks/wonks/pundits got us a copy and guest account, so ask and you may receive! Too Hard On Themselves? The View From D.C.
2) Sanctions are being applied infrequently and N.C.L.B. public choice is rarely chosen. 3) The biggest positive effects may come from the Supplemental Services portion of the bill. But that too is unevenly available across the districts. Well, this problem took 100 years to build, and five years is a bit of a short time to turn it around. Especially with fundamental union opposition. Still, every other profession has improved itself using metrics, and this one will too, in its own sweet, and perhaps painfully long time. If you oppose national government testing, why, jump right in here and help build a movement for a more sane approach to education metrics.